Get your team together and show your support at your next upcoming Asperger's Awareness Event with your matching Personalized Asperger's Team Hoodies. 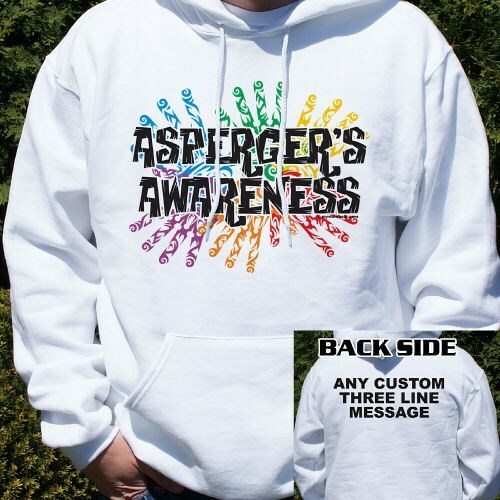 Each Personalized Asperger's Hooded Sweatshirt creates a unique way to show your support and helps spread awareness to those around you with little knowledge of this condition. Your Personalized Asperger's Team Hoodie is available on our premium white, pink, & ash gray cotton/poly blend Hooded Sweatshirts, machine washable in youth sizes S-L & adult sizes S-2XL. Each Personalized Hoodie includes free personalization. Personalize your Asperger's Awareness Hooded Sweatshirts with any three line custom message on the back. Additional Info April is Autism Awareness Month. Help make life easier for families who have children with Asperger's by showing your support with Personalized Autism & Asperger's Awareness Apparel & Walk Gear from MyWalkGear.com. Wearing an Asperger's Awareness Shirt will help educate everyone about the diversity of the people and families living with this condition. This Asperger's Team Hoodie is perfect for your next walk event and looks great with our Asperger's Awareness Hat and our Asperger's Awareness Sweatshirt.